NuGet is a great way of distributing software packages you use during development of your .NET applications. Because NuGet itself is open-source, the team have given tools (such as NuGet.Server and NuGetGallery) to help you jump-start deploying your own package feeds which can become integral to your company's development workflow. 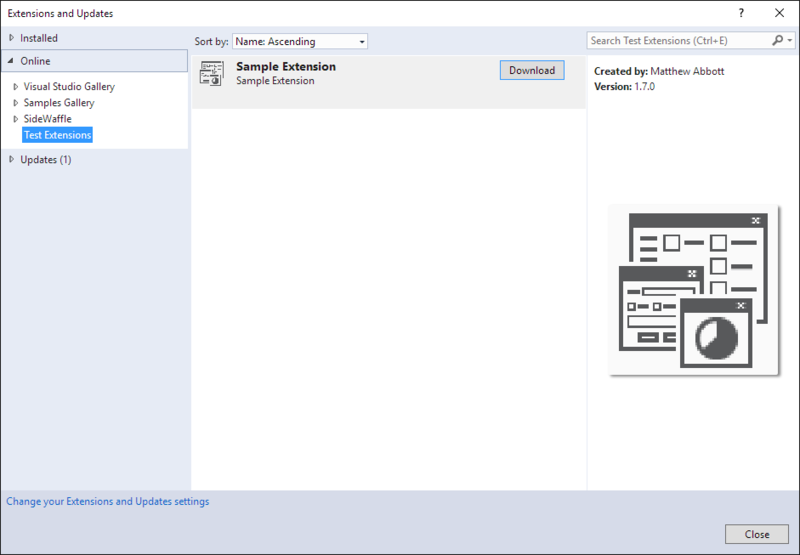 Another aspect of development with Visual Studio is extensions, which can come in a variety of forms, from IDE updates, language services, and even project and item templates. Sadly at this point, the mechanism by which updates are made available does not currently align with how software packages are provide. 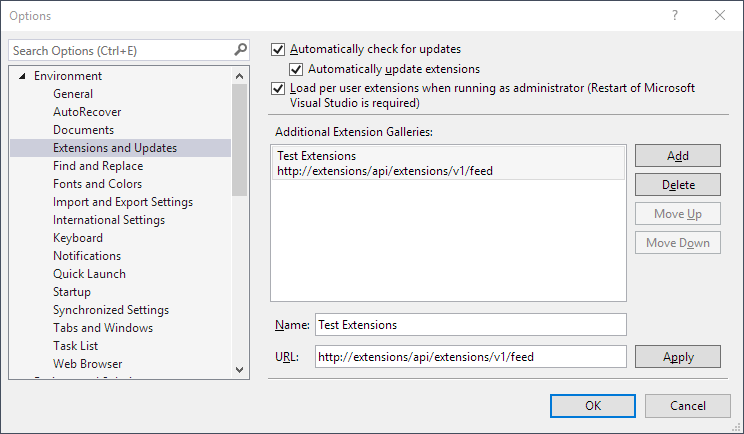 For Visual Studio Extensions, these are provided through an Atom feed. Because this is feed-driven, it does open up scenarios whereby we could publish our own Atom feed for our own internal extensions, much like running a private NuGet feed. This got me thinking, that perhaps we could utilise the NuGet Gallery backend to provide a feed, but adapted as an Atom feed to be consumed by Visual Studio. Turns out, it's relatively easy to do, so first things first, I forked the NuGetGallery repo and got to work. My first port of call was to understand how the Atom feed was structured, and broadly it boils down to adding a custom <Vsix></Vsix> for handling versioning and Id, and update the <content> element to point to the location of the .vsix package. I've added a custom XDocumentResult type which renders an XDocument to the response stream, but I've omitted it here for brevity. My CreateFeedDocument result constructs an XDocument by naively reading from the ISearchService with no arguments. I wanted to short-cut this part for getting results. This will generate a URL similar to /api/extensions/v1/<package-name>/<version> which will implement soon. 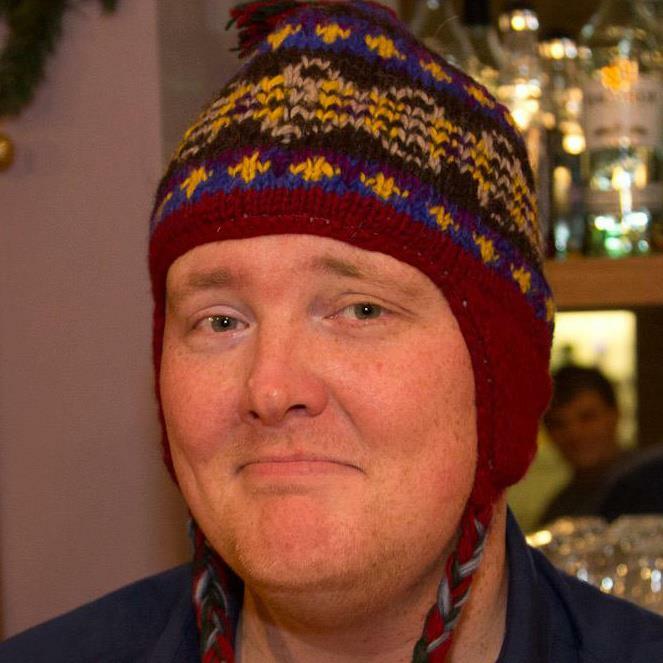 The <Id> element is quite important, as this unique ID (which is the same ID set in the .vsixmanifest file) is used by VS to determine what is installed and at what versions. As mentioned previously, NuGet packages are really just zip containers, and the standard NuGetGallery project doesn't do much in terms of reading the content, but with a few small modifications to the INupkg and NuPkg types, we can expose a method to read from the package on server. Here we are actually first finding the .vsix package within the NuGet package, and then return that to the response using the standard FileStreamResult. We should now be in a position to install the package from our custom feed. 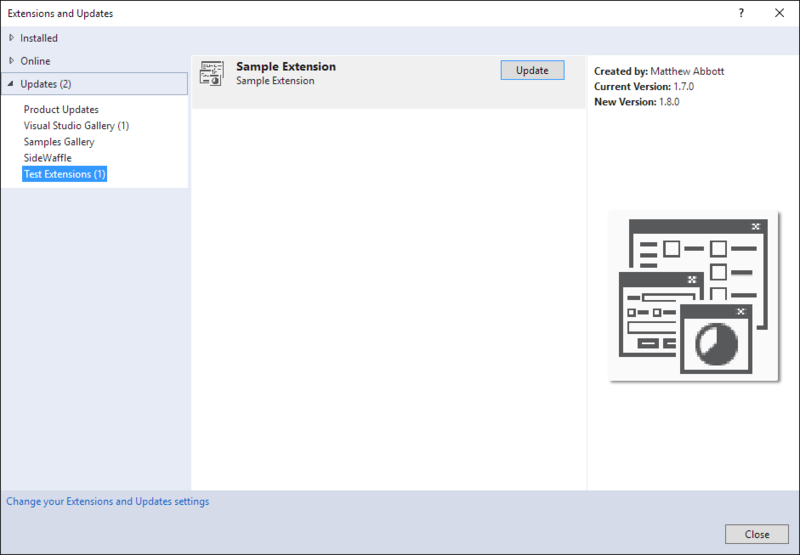 Updating extensions from NuGet feeds. If Automatically update this extension is enabled, then you may not even have to update the extension, as VS will check daily (and every time you open the Extensions dialog) for new extensions. So, imagine now how you can utilise the power of NuGet to deploy your internal extensions, like project templates and items, using the same tool chain as deploying your own NuGet packages. The code is available as a fork on GitHub.